The DNH 7 Paranthropus robustus skull from DMQ, the most complete skull of this species ever discovered and a rare female example. 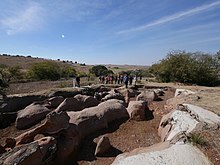 The Drimolen Palaeocave System consists of a series of a terminal[disputed – discuss] Pliocene to early Pleistocene hominin-bearing palaeocave fills located around 40 kilometres (25 mi) north of Johannesburg, South Africa, and about 6 kilometres (3.7 mi) north of Sterkfontein in the UNESCO World Heritage Site Cradle of Humankind. The site was discovered on 9 July 1992 by Andre Keyser and he continued to direct excavations at the site until his death in 2010. On 21 October 1994, Keyser discovered the DNH 7 (Eurydice) skull, the most complete Paranthropus robustus skull found. It is also considered a rare female skull of P. robustus. DNH 8, a male mandible called "Orpheus" was also discovered at the same time and adjacent to DNH 7. Colin Menter directed research and excavations at the site from 2010 until 2016. Excavations at the site were conducted by technical assistants in the early years and by a number of field schools in the latter years. These include the University of Florence, Italy (2006-2012), the University of Victoria, Canada (2011, 2012, 2014), and La Trobe University, Australia (2013–present). The permit and excavations at the site were taken over by Stephanie Baker of the University of Johannesburg in 2017 in collaboration with Andy Herries of La Trobe University (& the University of Johannesburg) as part of an Australian Research Council Discovery Project (2017–21). This also involves collaborations with David Strait of Washington University in St Louis, who runs a US based field school at Drimolen every June , as well as researchers from South Africa, Australia, the US and Italy. 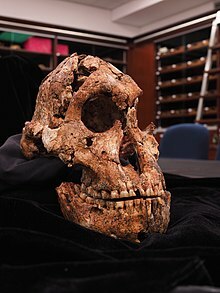 All the hominin remains have been recovered from the classic area of the site known as the Drimolen Main Quarry (DMQ), and include remains of Paranthropus robustus and early Homo. DMQ has also yielded some of the world's oldest bone tools and some of South Africa's oldest stone tools. It is also the first site in the region to have yielded two species of Dinofelis in the same deposit, Dinofelis cf. barlowi and Dinofelis aff. piveteaui. In 2013 a new fossil deposit was discovered around 50 metres (160 ft) away from the Main Quarry that is known as the Drimolen Makondo (DMK). DMK has not yielded any hominin remains but has been dated to a much older time period around 2.61 Ma, making it similar in age to sites such as Sterkfontein Member 4 and parts of the Makapansgat Limeworks. While DMQ consists of a single large palaeocavern, DMK consists of a series of interconnecting, low maze-like passages. It is not known how the two caves relate to each other and whether they were once part of the same interconnected cave system, but basal speleothems in each deposit have been dated by uranium-lead to ~2.6 million years ago, the same age as flowstones underlying the Australopithecus africanus bearing Sterkfontein Member 4 and capping the A. africanus bearing Makapansgat Limeworks Member 3 deposits. ^ Hancox, Phillip J.; Schoville, Benjamin J.; Strait, David S.; Ritzman, Terrence; Paul, Bence; Green, Helen E.; Hellstrom, John C.; Woodhead, Jon D.; Herries, Andy I. R. (21 November 2018). "U–Pb-dated flowstones restrict South African early hominin record to dry climate phases". Nature: 1. doi:10.1038/s41586-018-0711-0. ISSN 1476-4687. ^ a b c d Herries, Andy I.R. ; Murszewski, Ashleigh; Pickering, Robyn; Mallett, Tom; Joannes-Boyau, Renaud; Armstrong, Brian; Adams, Justin W.; Baker, Stephanie; Blackwood, Alex F.; Penzo-Kajewski, Paul; Kappen, Peter; Leece, AB; Martin, Jesse; Rovinsky, Douglass; Boschian, Giovanni (2018). "Geoarchaeological and 3D visualisation approaches for contextualising in-situ fossil bearing palaeokarst in South Africa: A case study from the ∼2.61 Ma Drimolen Makondo". Quaternary International. 483: 90–110. doi:10.1016/j.quaint.2018.01.001. ISSN 1040-6182. ^ a b Keyser (2000). "The Drimolen skull, the most complete australopithecine cranium and mandible to date" (PDF). South African Journal of Science. 96: 189–197. ^ "Washington University Drimolen Cave Field School Summer Program". ^ Moggi-Cecchi, Jacopo; Menter, Colin; Boccone, Silvia; Keyser, André (2010). "Early hominin dental remains from the Plio-Pleistocene site of Drimolen, South Africa". Journal of Human Evolution. 58 (5): 374–405. doi:10.1016/j.jhevol.2010.01.006. ISSN 0047-2484. ^ Stammers, Rhiannon C.; Caruana, Matthew V.; Herries, Andy I.R. (2018). "The first bone tools from Kromdraai and stone tools from Drimolen, and the place of bone tools in the South African Earlier Stone Age". Quaternary International. doi:10.1016/j.quaint.2018.04.026. ISSN 1040-6182. ^ Menter, Colin G.; Herries, Andy I. R.; Rovinsky, Douglass S.; Adams, Justin W. (18 April 2016). "Macromammalian faunas, biochronology and palaeoecology of the early Pleistocene Main Quarry hominin-bearing deposits of the Drimolen Palaeocave System, South Africa". PeerJ. 4: e1941. doi:10.7717/peerj.1941. ISSN 2167-8359. PMC 4841245.